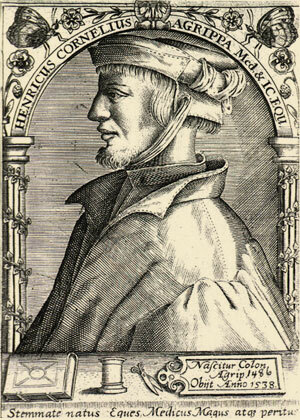 The major representative of esoteric and occult writing during Renaissance, Heinrich Cornelius Agrippa was a controversial personality, who was in constant conflict with the Church, had lost several important positions because of his beliefs and practices, and posthumously, he was accused of being a charlatan and a demonic magician. However, despite all accusations and suspicions, his career was so diverse that extended from working as a soldier and secret agent to setting up medical practices and alchemical laboratories along with teaching in several Universities in France and Italy. Agrippa had a great many influential friends all over central Europe, and they often helped him while moving from one place to another, and offered him important posts, such as Town Advocate and Town Orator. His three books De Occulta Philosophia Libri Tres are the most comprehensive source of information on Western occult and magic, and for almost five centuries, they have been widely read by those seeking information on ancient wisdom, ancient theology, instructions on alchemical practices and methods to control the natural world, and the world of spirits. Cornelius was born in an upper-class family, on September 14, 1486 in Cologne, Germany. His father, just like his forefathers, was in the service of the House of Austria. As Cologne was one of the most important highways for trade at that time, young Cornelius was fluent in several European languages. He entered The Cologne University in 1499 and obtained his MA in 1502. While being at University, he became interested in the natural philosophy of Pliny the Elder, and studied the works of Ramon Lull, a well-known medieval Catalan mystic. Not much is known about the years after his graduation, but his life is well documented after 1507, due to a great number of letters that he exchanged with his friends while he was in France or Italy. He is thought to have entered the German Court as an attendant to the Emperor Maximilian I, and served first as a secretary, and then he was sent as a soldier or secret agent to Italy, Spain and probably to England. In his first letters he mentioned his acquaintance with several historical figures and several friends, who shared his interest in the occult. In 1509, he lectured at the Dole University, on Johann Reuchlin's book De Verbo Mirifico but because of his respect for Jewish scholars, Agrippa was accused as a heretic supporting Judaism, and was forced to leave his University post and return to Cologne. In 1510, he met Abbot Trithemius of Sponheim, who was an expert on the occult, and Cornelius presented him with a draft of his major work De occulta philosophia. He stayed in Italy for seven years, until 1518, and he accepted profound influence by Hermetic, Neoplatonic and Cabalistic ideas, and he came in contact with Italian occultists, he gave public lectures on Pimander, a Hermetic treatise, and got married to a young lady from Pavia. He later became advocatus and orator in the imperial city of Metz, but was denounced for defending a woman who was accused of witchcraft. He spent the next six years of his life travelling from Metz to Geneva and Fribourg, three French-speaking cities, where he was acquainted with ideas of religious reform inspired by Martin Luther and Erasmus. He worked successfully as a legal adviser and physician, but in 1521, while travelling from Cologne to Geneva, his wife became seriously ill and died. Later, he got married again in Geneva. From 1524 to 1528, he was the Royal physician in the court of Louis of Savoy, and that was the period when he wrote his second most widely-read book, De vanitate, but when he got in a conflict with the Queen Mother, his payment was cancelled and he moved to Antwerp, where he also practised as a physician. Because of the plague, his second wife died in 1529 and it is thought that he married again in Mechelen Belgium, a few years before his death. The same year his wife died, he was appointed as an archivist and historiographer for Margaret of Austria, who was the governor of the Netherlands at that time. It was in Antwerp where he started publishing his books, but De vanitate attracted a lot of critisicm, and the book was condemned as impious and heretical by the High Court. In 1532, he left for Bonn as he was afraid of being imprisoned because of debts. For the following two years he lived in Bonn under the patronage of Archbishop Hernann von Wied, who shared his interest in the occult and published his complete work De occulta philosophia in 1533, which was previously strongly attacked by the Dominican inquisitor. The following year, he left for France and died in Grenoble on February 18th 1535. Agrippa showed determination to use magic the way he would use a useful science. He wanted to rid magic of demonic practices, and turn it to a perfect tool that would contribute to the benefit of humanity. In his book Occult Philosophy, Agrippa explained that magic was not connected with demons or sorcery but with the personal gift of psychic powers, and that the secret of using such powers was to successfully blend philosophy with physics and mathematics. He also maintained that in order to produce the desired effects, or achieve communion with the divine, the magician had to use his will power and be well aware of the natural harmonies. He was deeply interested in medieval magic but wanted to free it from the dangerous rituals of witches and sorcerers, while tying to merge occult knowledge from northern Europe with Italian occultism. 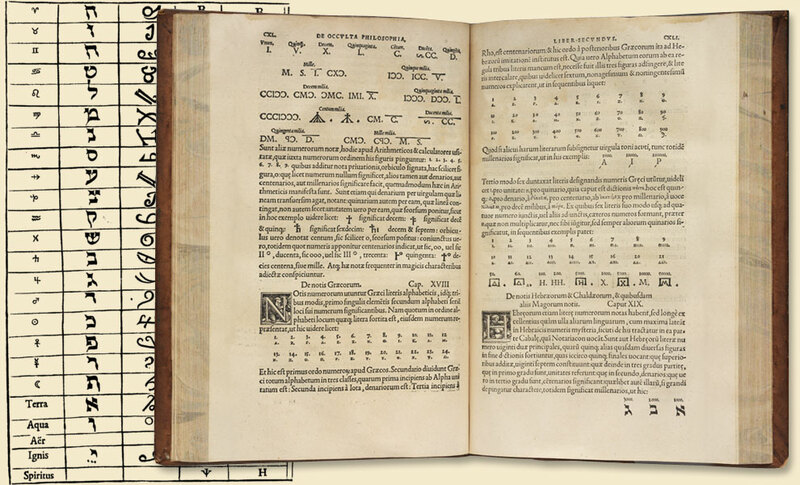 Agrippa knew that ancient wisdom and old pagan practices had been completely left out from religious philosophy during his time, and while he was in Italy he was influenced by Hermetic treatises, the Jewish Cabala, the theories of the Florentine philosophers Marsilio Ficino and Giovanni Pico della Mirandola. He was also influenced by the Neoplatonic belief that man is the microcosm that contains all the components of the universe, or the macrocosm, thus being a complete entity on his own. All those influences are apparent in his works: On Three Ways of Knowing God, On the Original Sin, and A Dialogue on Man. In the three books of his masterpiece, The Occult Philosophy, Agrippa divides the world in three sections: the elementary, the celestial and the intellectual, and believes that every inferior world is governed by its superior. His first book deals with the elementary or material world, whose main elements are: earth, water fire and air. In his second book, he deals with the celestial world, the magic properties of science and mathematics, and how the material world is influenced by celestial bodies and astrology. In his third book, he describes the spiritual world of angels, other heavenly beings and spirits, and the way one can communicate with them and with God, by using secret symbols and special talismans. Agrippa believed that if man becomes spiritually enlightened by using occult learning, he will be able to achieve mastery over the natural world, something that Adam was capable of, as long as God's divine light illuminated his soul, but he lost it after the original sin. He knew that magic was viewed with great suspicion by the priests, but he saw it as "the absolute perfection of the most noble philosophy." His aim was to gather all available knowledge in order to reconstruct the holy wisdom of the ancient times, which had been lost through the centuries, and which was given by God to a small minority of wise men, like Moses and Hermes Trismegistus, as well as the Egyptian, Zoroastrian, and Greek Orphic priests. During his life, but mainly after his death, there have been stories and fabrications coming from popular literature and people's imagination, that surround Agrippa's personality with awe-inspiring mysteries, such as the famous story of the black dog, which was Agrippa's familiar and was released at the time of his death. From the legend of Faustus and Mary Shelley's Frankenstein, up to Harry Potter movies, Agrippa's personality has never ceased to captured the imagination of fiction readers all over the world.